Durham Castle, together with the Cathedral, was awarded the status of a World Heritage Site in 1986 providing international recognition for this unique, historic and scenic site. Standing side by side on a prominent hill top site and encircled by the wooded slopes of the meandering River Wear, the Castle overlooks the medieval City of Durham with its fascinating narrow streets. 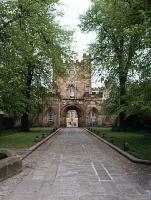 Durham Castle is a registered museum as well as a vibrant living and working community. It is the home of University College, the founding College of Durham University and over 100 students are resident during term. In view of this, entrance to the public is by guided tour only. The following tour times are a general guide as it is sometimes necessary to cancel tours at short notice due to University or commercial activities.